ca 8' dia. Stone ca 7' high Two curved C shaped forms placed at perpendicular angles. Approximately 4 foot diameter. A cement disk with a cleft at the top acts as a sundial. Cement, wood. Granite four-dialed pillar about 5 foot high, possibly dating from the mid 17th century. Purportedly found in 1650 in Tinturn, Monmouthshire, England, and consistent with the dial latitude of 52 N. Dial face is 18 x18 inches. Gnomons on both east and west sides are turned off its original declination. A gift from Robert H. Allerton. The dial is well-traveled, and was brought to the United States in 1890 by the John Wanamaker stores. The fascinating history of this dial can be found in NASS Compendium Vol. 6 No. 1, Dec., 1998. This was once a horizontal sundial of unknown construction commissioned by the Works Progress Administration. The dial has been removed and only a 24x24 inch pedestal remains, now adorned by a flower pot. This equatorial dial sits on a 61-inch octagonal base that serves as a columbarium. The dial is reminiscent of Erickson Memorial sundials. This granite sundial is 38.5 inches in diameter and 6 inches thick. The 3-inch diameter gnomon is made of hollow galvanized steel pipe with a white powder coating. The engraving on the sundial was done using a rubber stencil and sandblasting with aluminum oxide abrasive. No water jet was used. The center core hole was cut using a diamond segmented coring machine, like a big drill press with an expensive hole saw. A cast bronze horizontal dial with hour, half-hour and quarter-hour lines and Roman hour numerals for 5AM to 7PM. Dial face symbol depicts a winged hourglass. This cast iron polar dial is centered in a 7 foot diameter, echoing the form of a "train wheel", matching the theme of a small park situated between a historic train station on the ancient Green Bay Trail and a pioneer cemetery. The polar dial has raised hour lines on the cast iron plate. Designed by Stephen Luecking and built at St. Mary's Foundry. A simple analemmatic dial with a cement base with marks for standing at the months of the year. Surrounding the base is a light brick plaza with markers for the hours. The plaza is surrounded by flowers. A 30-inch diameter cast bronze dial with natural patina after more than 30 years exposure. Replaces a "garden" dial donated by Class of 1967 but destroyed by vandals. Dial is located on campus of private school but available for viewing during daylight hours. 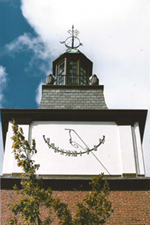 A unique horizontal dial using both a sloping 15 foot aluminum gnomon and much taller 45 foot vertical pole. The ground level dial face consists of seven analemmas drawn in the grass field that surrounds the dial center. The analemmas are drawn for the hours 8-AM to 3-PM 3, corresponding to the tip of the sloping aluminum gnomon. However, the noon analemma is larger and corresponds to the shadow of a disk atop the vertical pole. Horizontal dial 14 inches diameter, with 5 inch tall gnomon. Sits on stone pedestal 40 x 40 x 42 inches. Horizontal dial with 20 foot stainless steel gnomon. On the ground (dial face) are hour lines, analemma, date, and time before sunset. Built to commemorate DuPage County residents killed in military conflicts.